Of the 108 billion people born on Earth, you are here now. You are a miracle, and you have a Divine purpose, which you chose before birth (along with your parents, body and birthplace). Numbers are the language of the Universe. When used correctly, they can predict earthquakes, sunrises, harvests and eclipses – why not the meaning of life? Here’s the numerology system I use, which explains 1-9 and Master Numbers 11, 22 and 33. I cover your lifepath in detail in psychic readings. As a reference, I recommend Dan Millman’s The Life You Were Born to Live, here’s my reading for him. 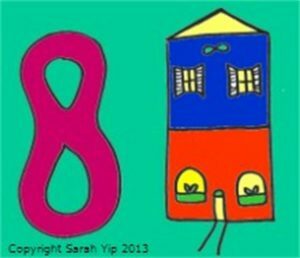 What’s the Numerology of your House Number & Address? Your numerology lifepath (or life purpose) is your ‘spiritual job description’, and the reason you incarnated on Earth. It comes from adding your date of birth from left to right, e.g. 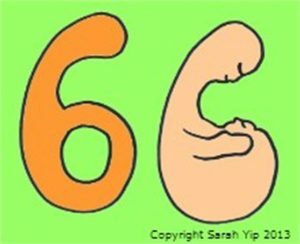 5/3/1967 = 5+3+1+9+6+7 = 31/4 or a 4 lifepath. Unlike other numerologists, I do not reduce the day/ month/ year first, as this loses information. All the numbers in your lifepath have a meaning, e.g. 4 and 31 are important ages for this person. They’re healing their 4th/ Heart Chakra and learning forgiveness (more below). If the sum of your date of birth is 11/2, 22/4 or 33/6, you have a Master Number lifepath, i.e. double responsibility, spiritual protection and opportunity to transform lives. You’ll need to read two sections below e.g. 2 and 11 lifepath information for a Master 11/2, as you can ‘flip’ vibrations. Master Numbers can appear in our lifepath, name and elsewhere – they don’t make you superior, just ambitious. Remember, we change lifepaths each lifetime so all powers are temporary. It’s like being a Superhero – you still have to choose wisely and have a big support team. You could fly twice as high but also crash twice as hard. I should know, because I am a 29/11. *At my lifepath peak age of 29 (your lifepath is a turning point), I took up numerology, studied nutrition, and was about to change houses, relationships and go full-time as a psychic! Due to free will, I sometimes add a year either side e.g. 28-29-30 was a dramatic time of change. Many children are incarnating with Karmic Debt lifepaths of 13, 14, 16 and 19 – if you are their parent, don’t miss this article on karmic debt numerology or generational numerology. Same goes if you are born on the 13th, 14th, 16th or 19th of the month. Although your lifepath is only one aspect (around 30%) of your numerology forecast, it’s a powerful overview of your journey. Browse my psychic readings of famous people to see how I use numbers. Incl. 10/1, 19/10/1, 28/10/1, 37/10/1 , e.g. 28/10/1 Steve Jobs invented the Apple Lisa at 28, just before launching the Macintosh. My husband Kris is a 28/10/1 lifepath. Pros: Independent, single-minded, loyal, confident and motivated. Cons: Aggressive, controlling, black-and-white thinking. Lifepath 1’s blaze a trail for others. See my Guide for 1’s, Anna Bligh and Miten’s readings. Also this 111 article and Charlie Chaplin – The 37/10/1 Who Stood Up To Hitler. 2017 was a Universal 1 Year and many 1’s had big shifts – see my 2017 Forecast. “Don’t know what to do? Ask a Two” Looks like a swan (FLOW=2) Sacral Chakra Incl. 20/2 and Master 11/2’s, e.g. 20/2 Julie Andrews made her Broadway debut at 19-20. Pros: Gentle, persuasive, charming, magnetic (Law of Attraction teachers) and intuitive. Cons: Shy, fearful, indecisive. Lifepath 2’s are here to balance others and to conquer fear. See my Guide for 2’s. 2018 was a Universal 11/2 Year, see my 2018 Forecast – I write on 11’s further down. Pros: Optimistic, logical, lucky, honest and imaginative. 2019 is a Universal 12/3 Year and many 3’s will step up. See this webinar and my Guide for 3’s – Part 1 Pros and Cons, Part 2 Career and Relationships, Part 3 Famous 3 Lifepaths and Part 4 Lifepath 3 Kids (coming soon). “Want to know the score? Ask a Four” Looks like a flag (DESIGN=4) Heart Chakra Incl. 4, 13/4, Master 22/4’s, 31/4, 40/4, e.g. 31/4 Oprah made her film debut in The Color Purple at 31 and met her life partner Stedman Graham soon afterwards. Pros: Stable, calm, patient, fair and team focused. Cons: Rigid, stubborn, dogmatic. Lifepath 4’s are quiet heroes who bring order to chaos. See my Guide for 4’s and Ian White and Karen Jacobsen’s readings. Also see Hong Curley’s readingIf you see 11:11, this is an awakening code for the Higher Heart Chakra and Universal Oneness (1+1+1+1 equals 4). “Need to feel alive? Ask a Five” Looks like a bike (or unicycle) (LEARN=5) Throat Chakra Incl. 5, 14/5, 23/5, 32/5, 41/5 e.g. 32/5 J. K. Rowling’s 1st Harry Potter book came out at 32. Pros: Free-thinking, progressive, objective, persistent, forever young. “Want a long-term fix? Ask a Six” Looks likes a mum and baby (TRUTH=6) Third Eye Chakra Incl. 6, 15/6, 24/6, Master 33/6’s, 42/6 e.g. 24/6 John Lennon’s career took off at 23-24. Pros: Gentle, wise, responsible and family-orientated. Creates boundaries. Cons: Martyr complex, oversensitive, a worrywart. Lifepath 6’s become guardians of the planet and others. See Natalie Cook’s reading (she’s a Master 33 – more info below), these posts on water and 666 numerology. My mentor and fellow psychic Vicki Haspels is a 24/6. “Looking for Heaven? Ask a Seven” Looks like a light (BOOK=7) Crown Chakra Incl. 7, 16/7, 25/7, 34/7, 43/7 e.g. 25/7 Elizabeth II became Queen at 25. Pros: Natural teacher, authentic, regal, spiritual guided and gifted with animals/ kids/ nature. Cons: Slow learner, obstinate, intensely private. Lifepath 7’s show that miracles are possible. See my Guide for 7’s and Rachael Bermingham’s reading. Also this post on 711 numerology. “Want to educate/ co-create? Ask an Eight” Looks like a house or an eternity symbol (FAITH=8) Karmic/ Higher Self Chakra, also connected to the Aura Incl. 8, 17/8, 26/8, 35/8, 44/8 (considered a Master Number in some circles) e.g. 35/8 Nelson Mandela founded the first black-run law firm in South Africa at 34-35. Pros: Abundant, careful, business-like, well-connected, successful. Cons: Materialistic, workaholic, pushy. Lifepath 8’s are big picture leaders. See my Guide for 8’s, Dan Millman’s and Salvatore Battaglia and Tina Arena and Robin Williams’ readings. Also this post on spiders and 35/8, Ed Kavalee and Sam Loch’s readings. “At a finish line? Time for a Nine” Looks like a big head! (GROW=9) Soul Blueprint Chakra Incl. 9, 18/9, 27/9, 36/9, 45/9 e.g. 27/9 Elvis was at his peak and working on his Grammy-winning gospel album at 27 – he was also a numerology fan! My son Forrest is an 18/9. Pros: Serious, compassionate, generous, flexible, healing abilities. Cons: Know-it-all, dominating, fanatical. Lifepath 9’s help people to let go and let God. 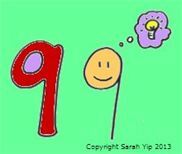 See my Guide for 9’s, Jung Chang and Tanya Targett’s readings. Also Adriano Zumbo – a 9 in the Firing Line. 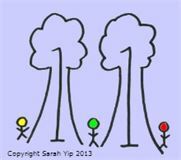 “Double ones of a kind” Looks like a gateway or forest (LIGHT and JESUS=11) Spiritual Library Chakra Incl. 11, 29/11, 38/11 e.g. 29/11 Terri Irwin moved to Australia and married Steve at 28-29, while 38/11 Madonna achieved her dream of being Evita and was pregnant at 38. I’m a 29/11. Pros: Inspiring, electrifying, productive, psychic, precise. Cons: Nervous, erratic, insecure. Lifepath 11’s build bridges for a new humanity, especially in 2018, a Universal 11 Year – see my forecast. Also check out my guide for 11’s and Famous 11 Lifepaths post. Many 11’s see 11:11 clocks, hence my lifepath 11 facebook page. I also recommend my posts on Captain Marvel’s 11 numerology, Frances Abbott and Cyntoia Brown. FYI, all 11 lifepaths are also 2 lifepaths. Pros: Strategic, disciplined, incredible planners, devoted and sacrificing. Cons: Stubborn, closed, may choose financial security over intimacy. Looks like a kiss or a butterfly (PRIEST and TEACHER and MICHAEL the Archangel=33) 33/6 Einstein began courting his wife, returned to teach physics and changed citizenship at 33. Pros: Courageous, outspoken (whistleblowers), leaders, cheerleaders who turn grief into hope. Cons: Forgets self-care, can get lost in people’s issues and drown with them. See my post on how letting people down can raise you up. Lifepath 33’s are here to demonstrate that we get what we give x 10. PLEASE, learn to deal with the critics, instead of falling into depression. You are a role model for positive change! See my guide to 33’s, Natalie Cook’s reading, my articles about Butterfly Saffigna and Gigi Hadid and Captain Marvel (Jude Law is a 33). Many 33’s see 11:11 clocks, feel free to join my lifepath 11 facebook page with Master Number tips. 2019 is a Universal 12/3 Year and many 33’s will be called up to the world stage, see my 2019 forecast webinar. Note: Souls are now incarnating with Master Number 44/8 Lifepaths The Master Builder – Double Security, numerologists differ in whether this is a Master Number (I believe it is). I discuss this and other lifepaths in my lifepaths webinar (AUD30). Got questions? Please, book a reading or a course. I also post as The Numbers Queen on facebook and have LOTS more articles on my blog. Happy awakening!